Operators of stochastic differentiation, which are closely related with the extended Skorohod stochastic integral and with the Hida stochastic derivative, play an important role in the Gaussian white noise analysis. In particular, these operators can be used in order to study some properties of the extended stochastic integral and of solutions of so-called normally ordered stochastic equations. 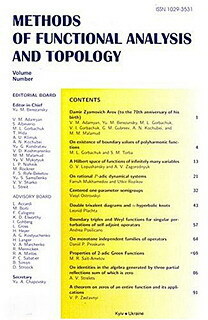 During recent years, operators of stochastic differentiation were introduced and studied, in particular, on spaces of regular and nonregular test and generalized functions of the Lévy white noise analysis, in terms of Lytvynov's generalization of the chaotic representation property. But, strictly speaking, the existing theory in the "regular case" is incomplete without one more class of operators of stochastic differentiation, in particular, the mentioned operators are required in calculation of the commutator between the extended stochastic integral and the operator of stochastic differentiation. In the present paper we introduce this class of operators and study their properties. In addition, we establish a relation between the introduced operators and the corresponding operators on the spaces of nonregular test functions. The researches of the paper can be considered as a contribution to a further development of the Lévy white noise analysis.